I've seen so many freaky things since I started attending Mythos Academy last fall. I know I'm supposed to be a fearless warrior, but most of the time, I feel like I'm just waiting for the next Bad, Bad Thing to happen. Like someone trying to kill me again. Everyone at Mythos Academy knows me as Gwen Frost, the Gypsy girl who uses her psychometry magic to find lost objects and who just may be dating Logan Quinn, the hottest guy in school. But I'm also the girl the Reapers of Chaos want dead in the worst way. The Reapers are the baddest of the bad, the people who murdered my mom. So why do they have it in for me? It turns out my mom hid a powerful artifact called the Helheim Dagger before she died. Now, the Reapers will do anything to get it back. They think I know where the dagger is hidden, but this is one thing I can't use my magic to find. All I do know is that the Reapers are coming for me and I'm in for the fight of my life. Usually when you read book series that consist of a ton of books the story seems to drag on and on or get duller and duller with every new segment of the series. But that is certainly not the case for the third installment of the Mythos Academy series Dark Frost. Jennifer did such an amazing job at this book and had me on my toes for a majority of the story. Gwen no longer seems like just a character but a real person that I can connect with, and I love it. Dark Frost was equal parts funny, romantic, witty, and super action-packed. I feel like every time I read the next book in the series I think to myself "This is my favorite book in the series!" and only repeat the process when I read the next book. I love Estep's humor and the characters she's created within the world of Mythos academy are so lovable, every time I pick up the book it's like I'm greeting old friends. Very few times have I read a book that left me so happy and elated when I finished reading it. But even though Dark Frost had a super steep cliffhanger I was grinning from ear-to-ear when I closed the book shut. Mythos Academy has easily become one of my favorite book series EVER. I'm super excited for the next installment to the series to continue the story of Gwen, irresistible Logan, and her friends. Even though I'm anticipating what's going to happen next because of the intensity of what happened in Dark Frost I think I'm going to wait a while before I read Crimson Frost to let everything sink in, including my whacked-out emotions that seem to be flying all over the place. 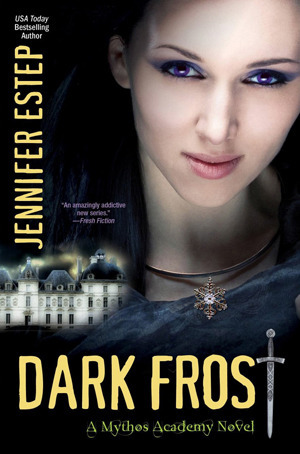 Congratulations Jennifer Estep, if I wasn't hooked before I certainly am now.